I ended up making my baby cousin a bag for her birthday (surprise!). I'm going to make her an Oliver + S lazy days skirt too, but I ran out of time. 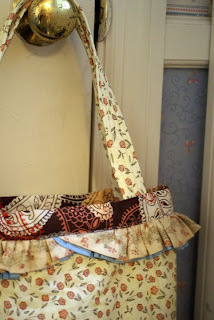 I decided that if Sam got a train car plane bag, Sophie can get a girly ruffly bag for her stuff. The pictures are weird because I forgot to take a picture before I gave it to her, so I had to take the pictures at my grandparents' house. A closeup of the ruffles. I love ending ruffles this way because you don't have to finish the ends! The birthday girl herself. It's fun having a cousin who is one because it makes me younger. You can't be that old if your cousin is only one! She has cousins older than me too - one in his thirties with two children! 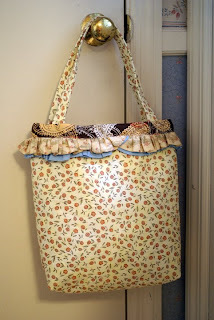 Love the ruffles on that tote! I have to say the 'plane' fabric is beautiful! Both little ones will enjoy their gifts. Darling!!! Oh gosh, how I love that bag! I see one in the future for Christmas presents for my two sisters. Cute, cute cute.